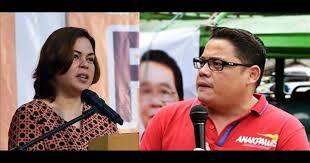 Davao City Mayor Sara Duterte-Carpio expressed to the members of the House of Representatives her wants to expel Anakpawis Rep. Ariel Casilao who she tagged as “an aberration to the government.” Sara even challenged Casilao to resign and continue to be part of his terrorist community and its communist movement. “Casilao is an aberration in government. Instead of working to help the workers and farmers he is supposed to represent in Congress, Casilao is now serving as the representative of the terrorists. His colleagues in the House of Representatives should expel him,” the city mayor said. Casilao therefore urged the mayor to first understand why communist rebellion persists in the countryside before concluding it was a waste of time to resume talks with the National Democratic Front of the Philippines.